ENCINITAS — Encinitas’ $3.7 million marine safety center at Moonlight State Beach won’t be completed by Memorial Day weekend, and its opening could be delayed until late July, city officials said this week. 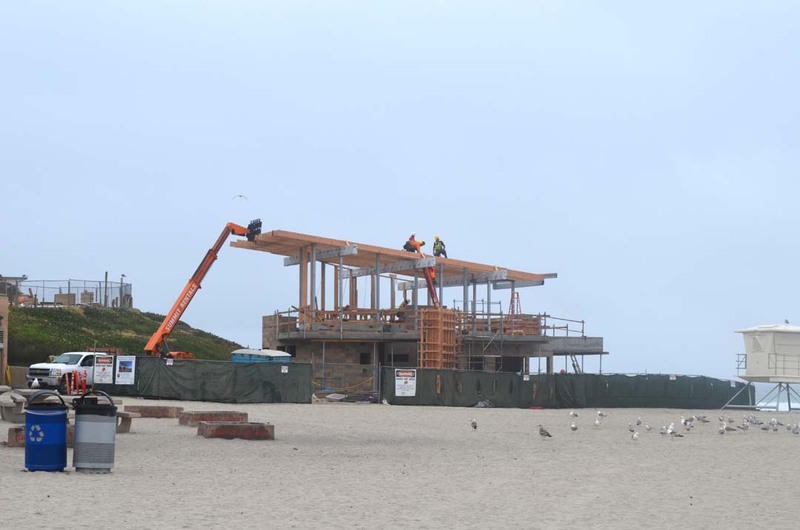 The City Council received the news from city engineering and marine safety staff at the April 26 City Council meeting, but some Encinitas residents had speculated for weeks that the lifeguard tower wouldn’t be completed in time for the start of the summer beach season. “We sure would like for it to be sooner, and we are looking for any opportunity to make that happen,” Associate City Engineer Stephanie Kellar told the council. A variety of issues have delayed construction, but the biggest cause of the delay was the winter rain season, which halted construction for 20 working days — more than a month, Kellar said. The discovery of lead, asbestos, plumbing and electrical issues and a second underground seawall during demolition also set back the delivery date of the project, Kellar said. Additionally, changes to the windows, which might appear like a minor change, required reworking on the structural plans and further delayed the project, Kellar said. And early on in the project, the city’s 30th Anniversary celebration at Moonlight Beach delayed the start of construction by several days. “It was just one of those snowball kind of things,” she said. Kellar said the city is working with the contractor on ways to accelerate the completion, including possibly working six days a week instead of five days or working longer hours. The City Council expressed disappointment in the delay, but said they were encouraged by city staff’s plan of action toward completion. Crews demolished the former 60-year-old tower in October 2016 and are replacing it with a 2,200-square-foot facility that officials said should serve as the hub for city marine operations for the next 50 years. Encinitas staff said that the city and its marine operations — including its lifeguards — had outgrown the current tower, which serves 3.5 miles of coastline with more than 3 million annual visitors. The city council in 2014 approved the selling of bonds to pay for the project, along with the purchase of the Pacific View Elementary School site. The city will pay a little over $800,000 annually over 30 years to pay off the debt. Marine Safety Capt. Larry Giles said that he would return to the council May 10 with a request to approve the proposed furnishings for the building.